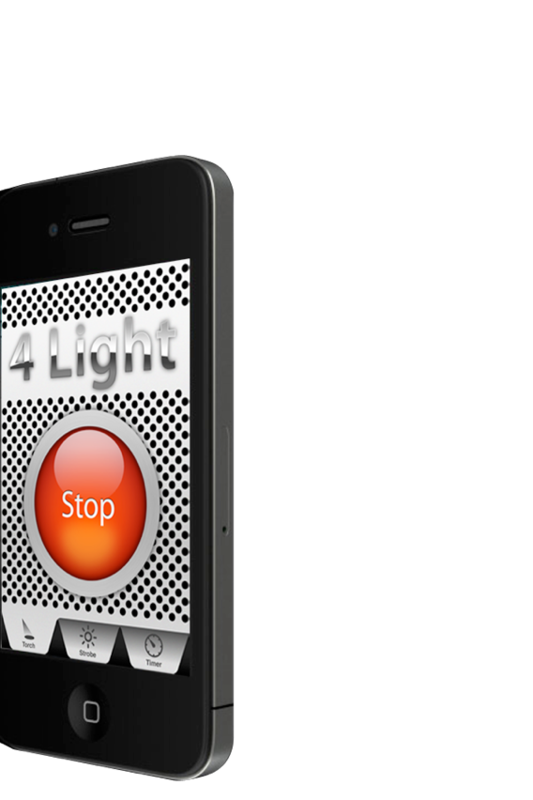 4 Light is a multi-purpose, instant flashlight designed exclusively for your iPhone 4. Torch, strobe or timed light can all be summoned quickly for your convenience. We use the iPhone 4 camera's built-in LED flash torch, which is much brighter than other flashlight apps that use only the screen. Get 4 Light today and reach for your iPhone 4 next time you need light. To switch modes while using 4 Light simply switch tabs. Tap the start button to activate the light. Find me in a crowd. •A Torch flashlight can be turned on or off with the tap of a button. •The Strobe can be set to variable speeds ranging from 20 to 1 flash per second. • The Timer will emit a continuos stream of torch light for a set length of time. Set a timed night light for the kids. Performing random shadow puppet shows. Copyright © 2011 Robert Cronkhite, Sam Dominguez, All rights reserved.